Japanese Biologist Wins Nobel Prize In Physiology Or Medicine : Shots - Health News The Nobel Prize in Physiology or Medicine goes to a Japanese scientist who explained that cells have their own versions of recycling plants, how they work, and the role of this process in diseases. 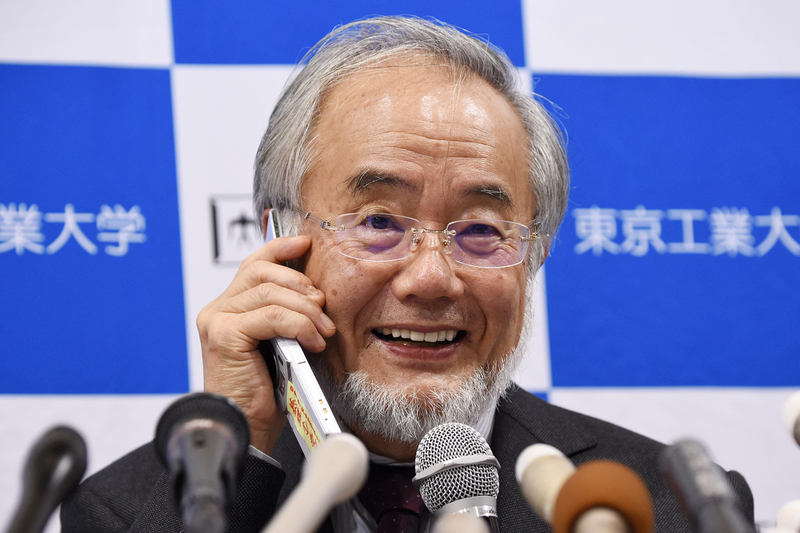 Yoshinori Ohsumi, a professor at the Tokyo Institute of Technology, smiles as he speaks with Japanese Prime Minister Shinzo Abe on a phone during a press conference in Tokyo today, after he was awarded the Nobel Medicine Prize. Yoshinori Ohsumi of the Tokyo Institute of Technology has won the 2016 Nobel Prize in Physiology or Medicine for his discoveries about "autophagy" — a fundamental process cells use to degrade and recycle parts of themselves. Ohsumi, 71, is a professor emeritus at the Tokyo Institute of Technology in Yokohama, Japan. As the sole winner, Ohsumi will receive more than $930,000. Ohsumi's work opened the path to understanding how cells adapt to starvation and respond to infection, according to statement from the Nobel Assembly at the Karolinska Institute. Mutations in the genes that control autophagy can lead to a variety of conditions, including cancer, type 2 diabetes and neurological diseases such as Parkinson's and Alzheimers, according to the announcement. Autophagy, a term that comes from Greek words for "self-eating," is a basic process cells need to function properly. "Without autophagy, our cells won't survive," says Juleen Zierath, who chaired the committee that selected Ohsumi. "We need autophagy to ward off invading molecules, for example, to deal with very large proteins that might be long-lived or defective. But we also need autophagy for renewal." Scientists had known about autophagy since the 1960s, but the process had been very difficult to study, according to the Nobel announcement. So the exact machinery involved was unknown, as was how the system worked and whether it was involved in disease. Before Ohsumi's work, scientists knew there was a structure inside cells that was considered the equivalent of a "waste dump," Zierath says. "What he showed was that it wasn't a waste dump. It was a recycling plant. This was a really sophisticated machinery that recycled damaged or long-lived proteins," Zierath says. Ohsumi showed this by conducting a series of "brilliant" experiments in the 1990s using chemically modified baker's yeast to identify key genes that are essential for autophagy, according to the Nobel announcement. These experiments enabled Ohsumi to decipher the complex series of chemical signals and events involved in the process. He then went on to show that similar sophisticated machinery is used in human cells. "Ohsumi's discoveries led to a new paradigm in our understanding of how the cell recycles its content," according to the announcement. "Intense research is now ongoing to develop drugs that can target autophagy in various diseases." Ohsumi and the winners of the remaining 2016 Nobel prizes will receive their awards at a ceremony in Stockholm Dec. 10. "All I can say is, it's such an honor," Ohsumi told reporters at the Tokyo Institute of Technology, according to the Japanese broadcaster NHK. "I'd like to tell young people that not all can be successful in science, but it's important to rise to the challenge."